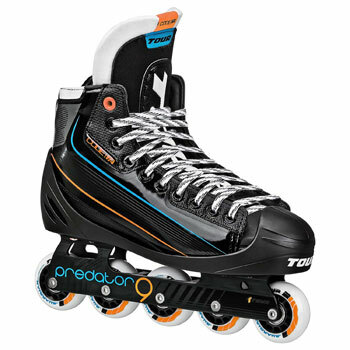 LG72 Roller Hockey Skates are the premier goalie skate on the market, designed for inline goalies by inline goalies. With a custom reinforced ankle stabilizer and lateral support system you will now be able to ""Feel The Floor"" better than ever. Designed and tested by pro goaltender, Brett Leggat, this skate provides the stiff COMPWEAVE Quarter construction and protection that goalies need without sacrificing comfort and weight. The DryWick quilted comfort lining provides excellent comfort while wicking away sweat and allowing maximum airflow.